I had to take a hiatus from the quilt for a couple weeks to deliberate about the batting I bought. It just didn't seem right to me and I had to consult with the "client" (HI LORI!) about it. I had chosen polyester fusible batting, but it didn't lay flat, it was too thick, and just wasn't right. After some consideration, I decided to head back to Joann's and pick up some (as thin as possible) cotton batting. This is supposed to be a light blanket, and I didn't want it to be overwhelmingly warm, but can I tell you? It is REALLY hard to find the super thin stuff. I know there is batting even thinner than the replacement batting I bought, but I couldn't find any. I went ahead and prewashed the cotton batting (it will shrink) by soaking it in hot water for 20 minutes, then air drying it on low heat. I then replaced the old batting with the new, cotton batting. Aaand we're ready to go again. You can also buy factory-made bias tape for this process (but then it may be a different color!) For more detailed instructions on how to construct bias tape, please visit my previous post on bias tape from my Bib Series. Here's a closer look. You'll have a little triangle of fabric. When you get back to the beginning, pin over the other bias tape reserving a couple extra inches of bias tape. Now it’s time to sew! Generally, you’ll want to sew on the ½” fold from the raw edge. However, since we’re working with homemade bias tape and not factory made, here’s a little extra detail. Fun Fact: Factory made bias tape has a short fold and a long fold. The short fold is sewed on first, and the long fold covers the whole thing. Now MY bias tape is completely equal on both sides. 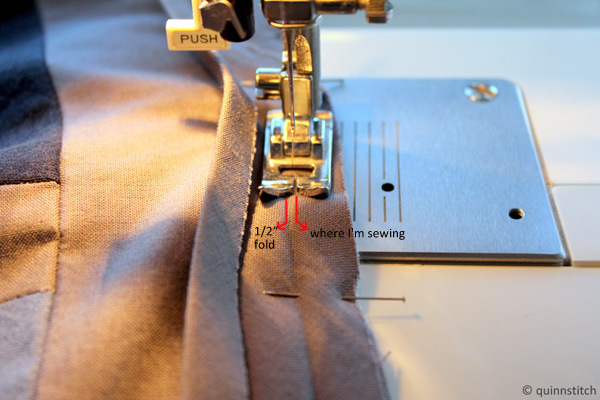 Therefore, in order for the bias tape to cover the thread I’m sewing on first, I’m going to sew juuuust inside the ½” fold. See? Then stop, back stitch, cut the thread, and start again on the other side of the triangle. Understand? See here's me squishing the dangly triangle down, with the sewn part underneath it. Continue sewing until you go all around the quilt. After sewing all the way around the border, now what we do is fold the bias tape into it's original shape, which covers the edge of the quilt. Pin all the way around the quilt, making sure that the thread from the line you just sewed is covered. Here's a few pictures that demonstrate this process. This is the edge of the bias tape where we put that little triangle fold at the very beginning. By pinning down that fabric in the shape we did, we get this attractive little seam where the two edges of the bias tape meet. Now all we have to do is attach the other side of the border. There are two ways of doing this. 1) You could top stitch the bias tape all around the border or 2) hand-sew the other edge of the bias tape on without bring the needle to the front of the quilt. I am opting for #2, because I like how you can't see the seam looks without the top-stitching, and I find it's more precise and neat. Begin by bringing the needle through the back of the bias tape so you can hide the beginning of the thread. Sew by bringing the needle through ONLY the back layer of fabric, and through the edge of the bias tape. Now continue doing this until you get the entire way around! So I'm gonna go do this now, it's going to take a while! :) If I get this done next week, I'll be beginning on the last step: QUILTING. We are so close, I can taste it! Make sure to check back weekly on Wednesdays, I'll be posting updates about this project! If you are unsure of anything I'm doing here, please let me know and I'll clarify. And as always, Thanks so much for visiting. I really appreciate everyone who reads and comments. If you like what you've seen here, please follow me on Facebook and Pinterest to receive updates. HI LAURIE! hehehe, I'm a client. I feel so special. You are doing such an amazing job on this quilt, Laurie!! Amazing tutorial! This is making me want to sew!! !